I’m going to break with tradition and start with Monday’s run. This week was once again a session based on 1000m reps. 7 x 1k with 1 minute recovery. Having not been to the gym in the morning I felt confident that I could stick more closely to the 4 minute target throughout this time. It seems I was successful. Mark and Rick paced the first five and I did the last two. My watch said I was doing 3.56 pace though I think I might have been going a bit fast but I kept the pace (whatever it was). On the last one my watch lost the plot and said we were doing 3.27 k pace which was obviously utter tosh so I had to try and keep up whatever pace I was actually doing for the whole rep. I did. I should imagine it was consistent with the rest as everyone else was around and about as before. Anyway I felt fine and didn’t think I petered out in the last few like last week. Tuesday brought with it an 11 mile hilly LSR. Splendid. Though as it was solo it felt like I was getting nowhere and it took forever. On Wednesday I had ideas of doing a medium distance run in the morning then the Arena tempo in the evening. Then I saw sense and didn’t. Instead I hoped to be able to pull a more tempo-ish tempo run out of the bag in the evening. Luckily the group consisted of no-one tapering or taking it easy (except the speedies whose taking it easy is still faster than my tempo pace) so it meant I was able to stick with Simon, Rick and Steve (not Steve) for the majority. Rick took us out for a very speedy mile from the King Alfred to the Peace Statue, sub 7, which was good. The average pace for the whole thing was 4.46 minute ks but this included my slow jog there and back so I think the actual tempo part (6 miles) was around 7-7.30mm. Sorry for the mix of metric and imperial! On Thursday I set out for a flat LSR. Felt pretty good and time not quite as draggy as Tuesday. 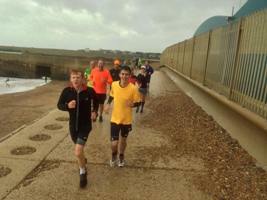 I did my usual seafront course which is 13 miles. 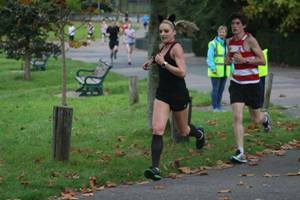 Saturday meant a special parkrun. Joe’s 50th run but more importantly Emily and I decided to dress as cats. Preston Park is not into dressing up so we knew we’d be alone. When we arrived I saw someone dressed as Where’s Wally but this turned out to be Sevenoaks Running Club. Oops. I had optimistically and stupidly set my watch to race the track 5k I did a while ago where I actually ran properly for once and finished in 20.10. There were too many people in the way and I soon lost the will to live so then had to endure my watch telling me I was being massively beaten by my former self. Though it gave up pretty quickly and remained silent until it buzzed around 400m from the end to signify that my former self had finished. Through a combination of reasons I slouched home in a crap 21.26. At least my HR monitor worked this week to cement the fact I obviously hadn’t tried very hard. Average 160bpm. This morning I set off with Rick to join the Arena posse for another LSR. It was rather windy and wet and I am feeling quite tired after a week of two LSRs. It was a nice run (apart from the running part) with a good group. Rick and I bailed at the Lagoon on the way back which still gave us just under 10 which was plenty for me taking me to 52 miles for the week.